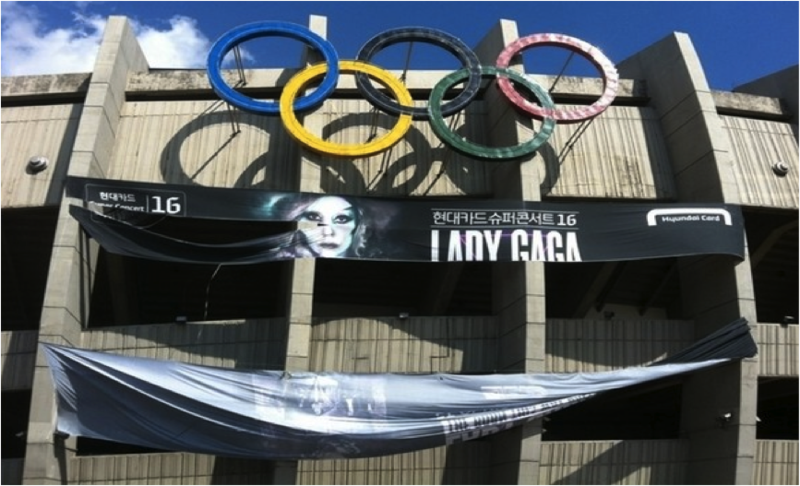 Soon after Lady Gaga’s worldwide Born This Way Ball Tour was scheduled to begin on April 27, 2012 with a concert at Olympic Stadium in Seoul, her concert tickets were sold out in the blink of an eye by enthusiastic Lady Gaga fans in South Korea. 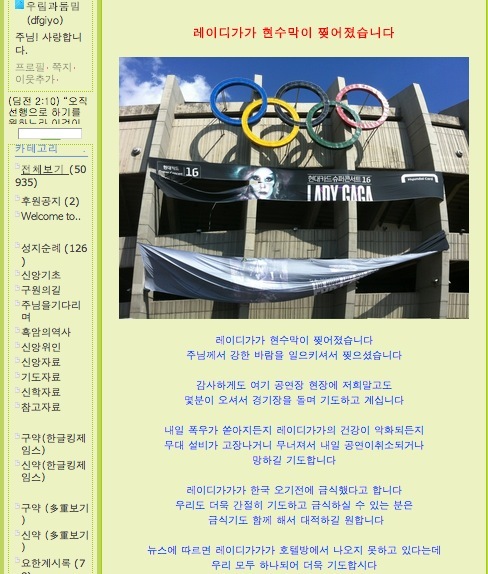 The Korean Association of Church Communication, however, immediately declared their opposition to the Lady Gaga concert with a statement titled “The Problem of Lady Gaga Concert in South Korea” on March 19, 2012. On March 22, the Korean Media Rating Board forbade South Koreans under the age of 18 from attending the concert. The concert was originally supposed to be open for anyone over the age of 12. 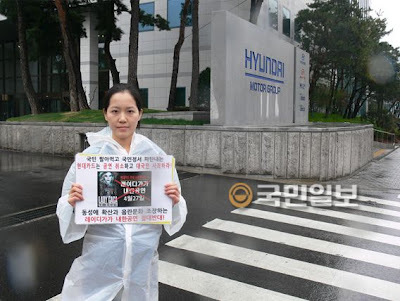 Civilians Network against Lady Gaga Concert on April 21 and Facebook Group against Lady Gaga Concert from April 23-27 protested in front of the Hyundai Group buildings, claiming that they would call for a boycott of Hyundai Card, the sponsor of the concert, unless Hyundai Card canceled the concert (Hyundai runs credit card business as well as car business in South Korea. Hyundai has achieved a great success in advertising and selling their credit card products by inviting foreign famous singers such as Beyonce, Maroon 5, Sting, and Eminem in the name of Hyundai Card Super Concert. 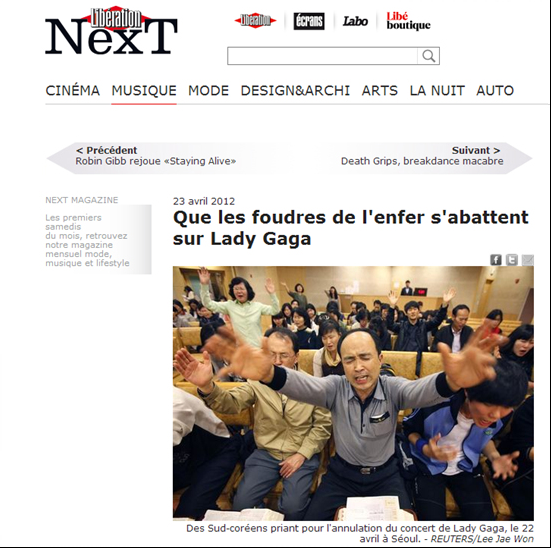 However, the Lady Gaga concert was the first case that Hyundai confronted such a huge protest against it). 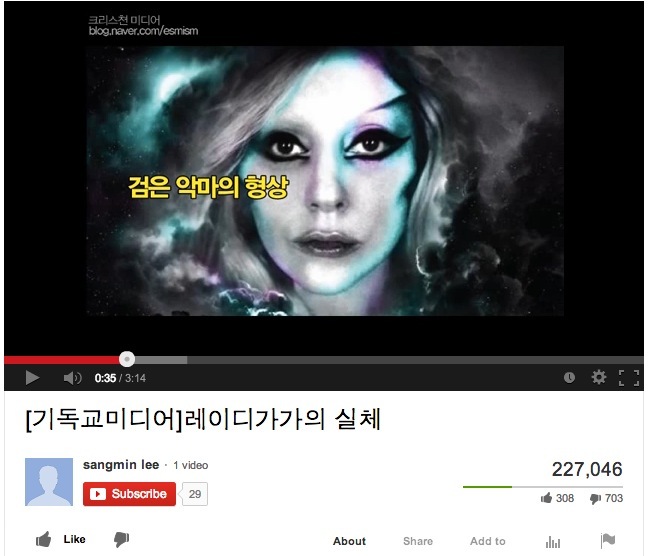 The dissenters, mostly comprised of Evangelical Protestants prominent in Korean Christianity, insisted that Lady Gaga glamorized homosexuality and suicide and her concert could bring a tremendously negative and dangerous effect on the overall morality and spirituality of South Korean youth. 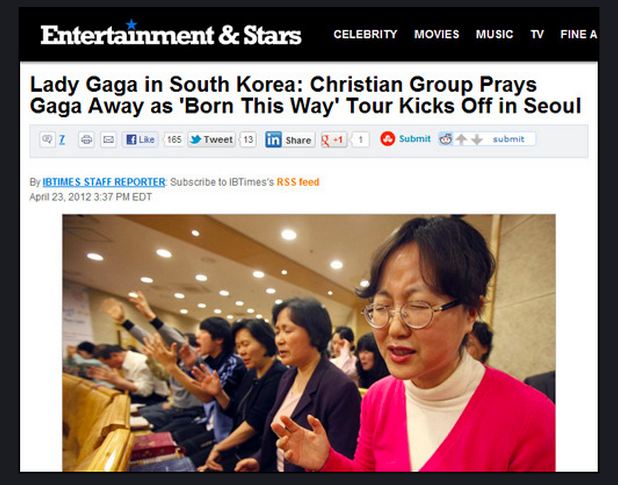 However, the protest of Evangelical Protestants against the Lady Gaga concert reignited the hatred against Protestantism already prevalent in South Korea. Liberal media opined that the aversion of Evangelical Protestants against Lady Gaga and the homosexual is irrational, fanatical, and pre-modern. Some pictures taken in a Pentecostal prayer meeting held on April 22, among a variety of pictures of the protestors, were selectively chosen and usefully employed to support their stance against the Evangelical Protestants. Above all, the pictorial images showing the Protestants yelling out unknown words and raising their hands in a seemingly fanatical atmosphere, completely fit into the prevalent social images of Korean Protestants regarded to be irrational, stubborn, and fanatical. These pictures were not only picked up by Korean online media but even employed by international online media covering the Korean protest against the Lady Gaga concert. Above all, the US and French news coverage was introduced by Korean media as a shameful representation of South Korea. Confronted with the seemingly irrational, pre-modern, and dangerous public face of themselves, how did the Evangelical Protestants react? 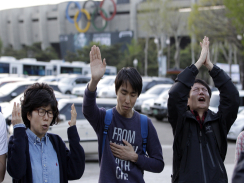 Surprisingly, there was not a notable formal refutation or denial of the conservative Evangelicals against the ugly public face of their protest in the South Korean media sphere. It is not clear whether the Evangelicals were unable to respond to the media representation of the protestors or no concern about gaining public support to their protest against the Lady Gaga concert. However, it is highly obvious and thus noteworthy that with established offline church communities, new digital social media played a tremendously crucial role in the genesis and development of their protest against Lady Gaga: the creation, dissemination, and reproduction of moral concerns and strong emotions, which are significant in the rise of most religion-based social movements, in the material form. In other words, the moral concerns about and negative emotions against Lady Gaga among Protestants would not have been easily materialized, produced, disseminated and reproduced this much without new digital social media. For instance, a YouTube video clip was created to raise moral shocks and strong repulsion against Lady Gaga concert among conservative Evangelicals and it acquired 227,046 views by October 1, 2013. Of course, some of the views must have been accumulated after the Lady Gaga concert was held. Furthermore, not everyone who watched the clip could have been an Evangelical Protestant. Despite this, however, it is still a great number of views and hard to easily ignore. Moreover, in digital space including the Facebook groups against the Lady Gaga Concert, this sort of YouTube video clip was actively shared by the Protestants who were against the Lady Gaga concert and homosexuality. In this way, a sense of threat to the morality of Korean youth was effectively visualized and further materialized even before Lady Gaga arrived in South Korea. Such materialization of moral concerns and threats and their dissemination through active sharing in digital space, show us that new digital social media are not a mere instrumental technology transmitting information for social actions, but can be a space in which people interact with each other, make meanings, and experience their own realities. Thus, media offer a platform and venue that lets the media users make, share, and experience their own meanings on their mediated realities. When it comes to religious people’s new media use, digital space helps people imagine new modes of religious identity, practice, and community by offering chances to individually and collectively make new symbols, images, and meanings of their religions and social realities. For instance, on the day the Lady Gaga concert was held in Olympic Stadium (April 27, 2012), one picture was posted on a Facebook group against the Lady Gaga concert, and it was shared by a significant number of Evangelical bloggers against the Lady Gaga concert. What caused this image to be shared and disseminated on a large scale was not just the visual image itself but also the new meaning making on the image. The first blogger who uploaded this image added his/her own interpretation of the image saying that God tore the Lady Gaga concert banner with a strong wind in order to show His will. This symbolic subversion (or imagination) of the meaning of the torn banner of the Lady Gaga concert truly captured the protesters’ hearts. It tremendously provoked conservative Evangelicals’ imagination and hope that the concert would not be held after all. In digital space, at some point, the single new meaning making on the torn banner with a visual image turned into a sort of mediated reality to a number of other Protestants against the Lady Gaga concert who are ready to imagine, believe, and embrace them. Digital space facilitates and enables such symbolic subversion much easier than legacy media. Especially, considering that Protestantism allows much freedom of individual interpretation of the Bible and of personal relationship with God, the characteristics of digital social media enabling and facilitating new imagination of religious meaning/practice/community is crucially significant in the modern transformation of Protestantism. It is an ongoing question to be noteworthy to observe whether, by means of new digital social media, conservative (and/or fundamentalist) Protestants would actively participate in a healthy conversation with other social groups in the society. Otherwise, by using new digital media, they can merely remain in and even reinforce their own fixed teachings, meanings, and realities that they want to believe, while continuously repressing or being isolated from other social groups. 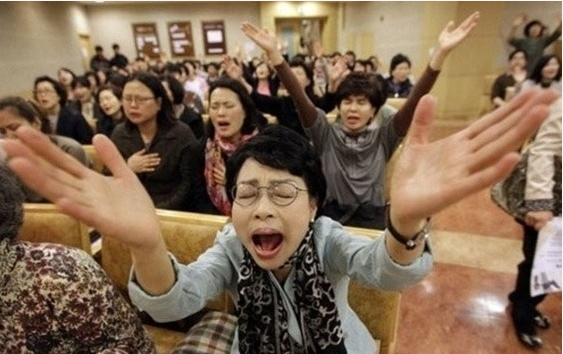 In the case of the South Korean protest against the Lady Gaga concert, to some extent, the Evangelical protestors were able to interpret their protest as a victory that God sanctioned with symbolic subversion through new digital social media. In reality, however, the concert was finally held at Seoul Olympic Stadium on April 27, 2012 without cancellation.